NTI Medical Lab graduate Cathy-Jean Licardo donating during the blood drive on August 25th. 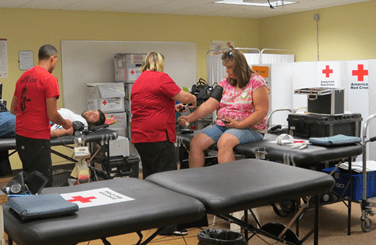 Northeast Technical Institute held a blood drive on August 25th. The American Red Cross brought in their equipment and set up in our clinical Medical Assistant classroom. Our waiting area was filled with students and donors from all over! The donors received Dunkin’ Donuts gift cards for their generosity. The goal was to collect 24 units of blood, but the ‘Double Reds‘ procedure was cancelled at the last minute. Donors registered online through the NTI portal, and this time around, we had 25 donors registered, but 3 were turned down for low iron. This blood drive was one to remember – NTI & the Red Cross collected 22 units of lifesaving blood!